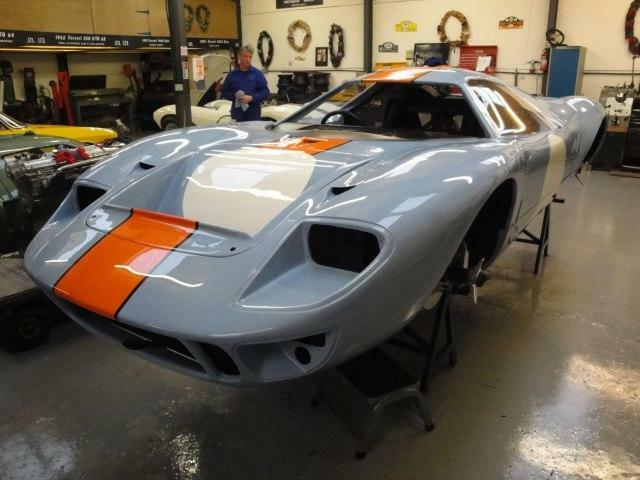 Gelscoe Motorsport and GTC Mirage have joined forces to re-produce the Mirage GT40. 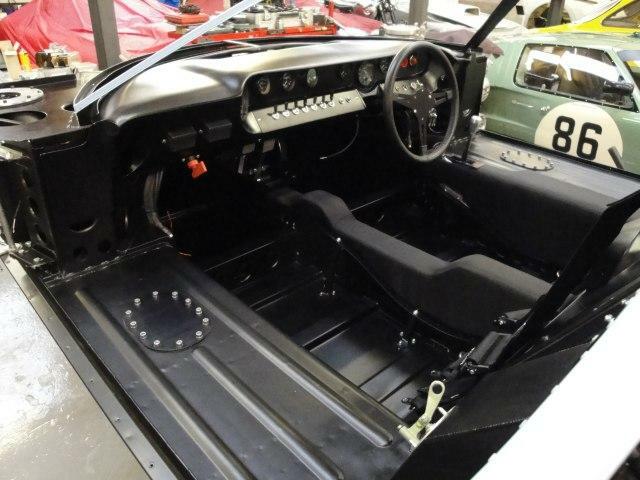 Built under licence for long time owner of Mirage, Harley Cluxton, the cars will be perfect in every detail. 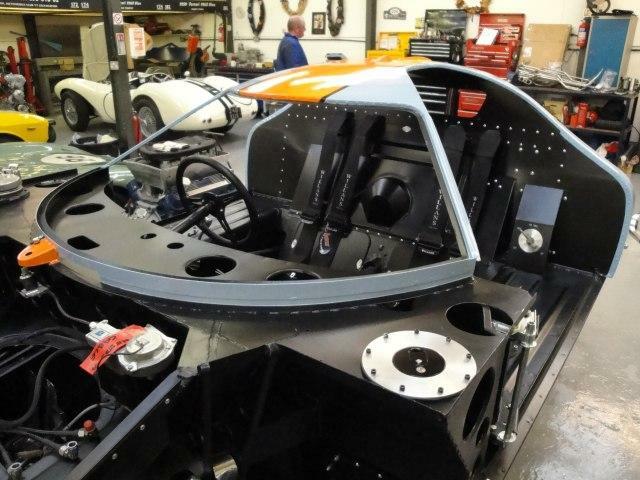 With the combined use of Gelscoe’s original drawings and the original data still housed with Mirage in the USA, this new project is well underway with the first Chassis being constructed. 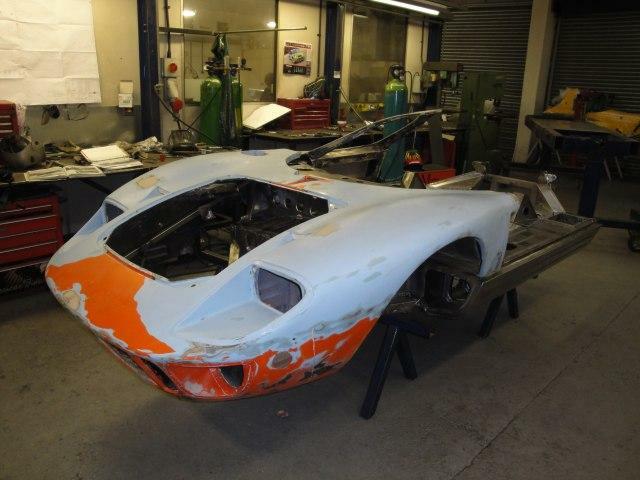 Original Mirage drawings will be used to produce the smaller Roof, Doors and rear Body which make the Car stand out from the standard GT40. 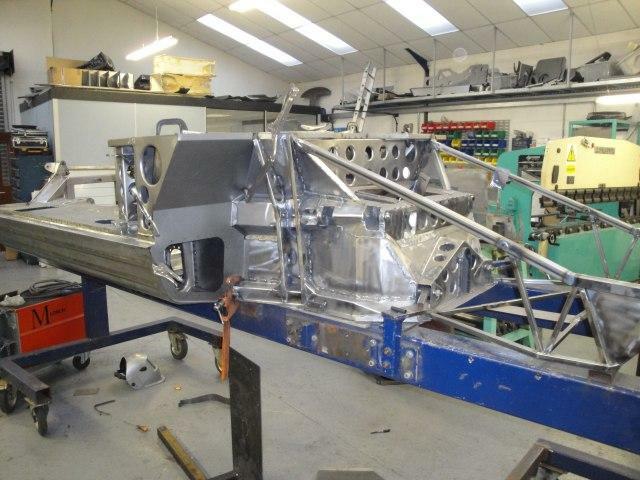 Work is now well underway on the construction of the Mirage Chassis. 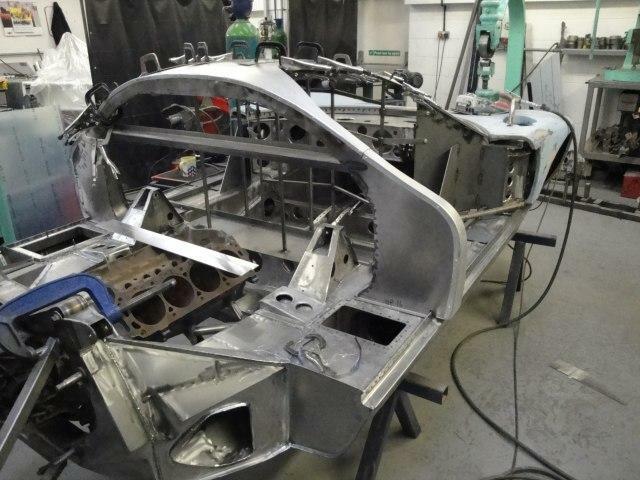 As the project takes shape we will add more photographs and information. 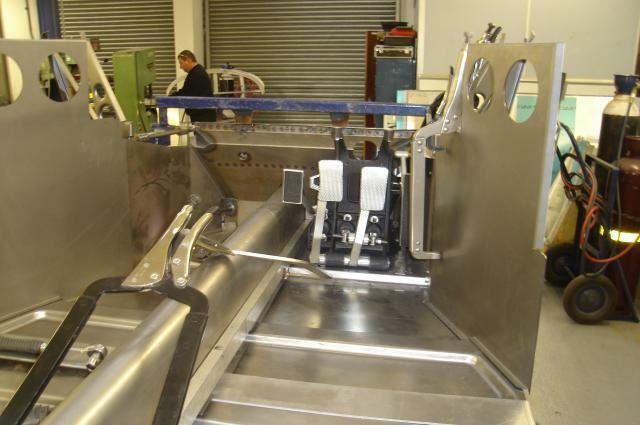 Completed pedal box is place into the Chassis very early on to check clearence. 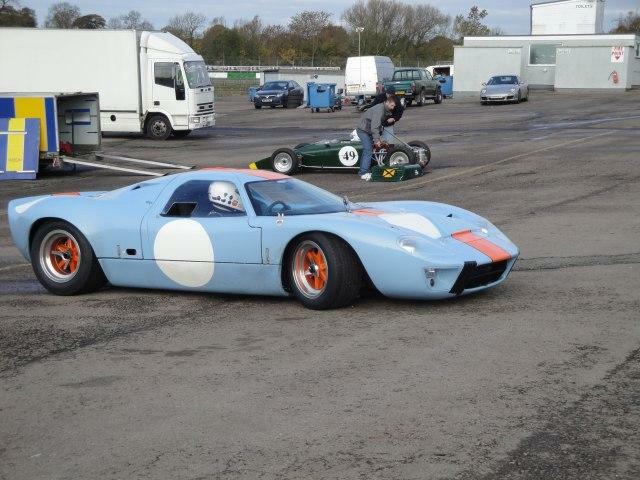 The side Pontoons differ from a normal GT40 Chassis, as with the Le Mans cars, a fuel cross over pipe is used. 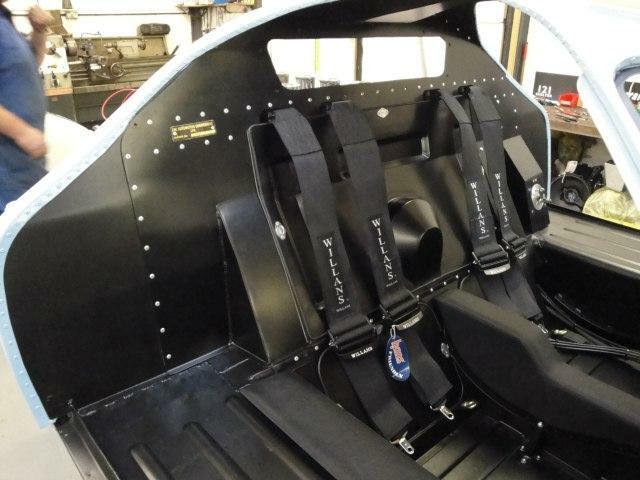 Seat back bulkhead now in place. 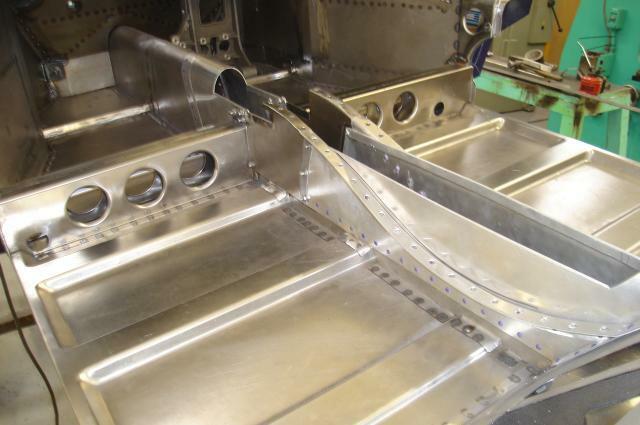 Internal tunnel is made from not only steel but also aluminium. 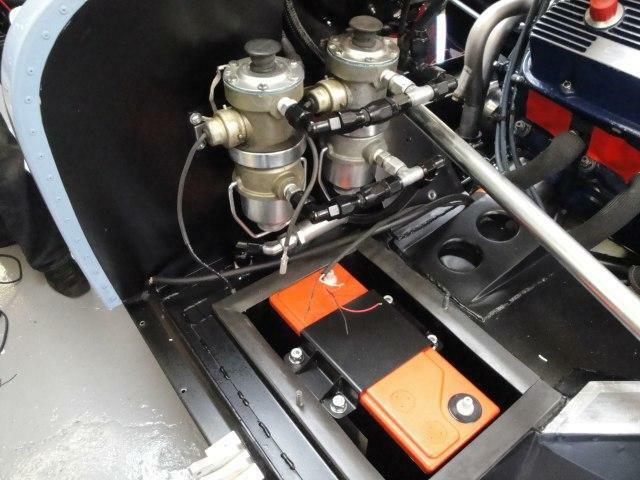 Only the fuel cross over cars had this system incorporated in the inner construction. 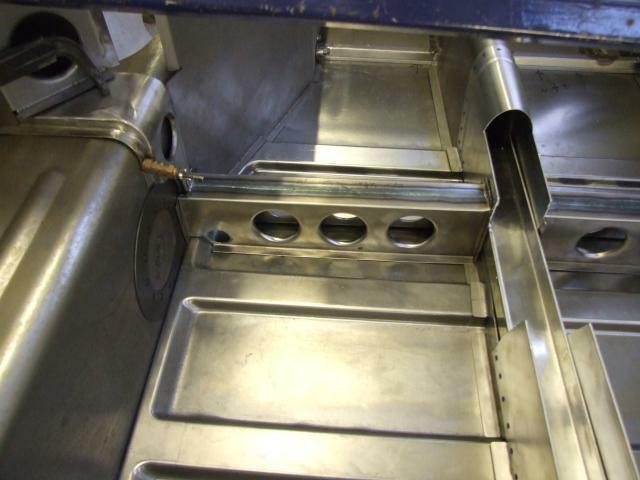 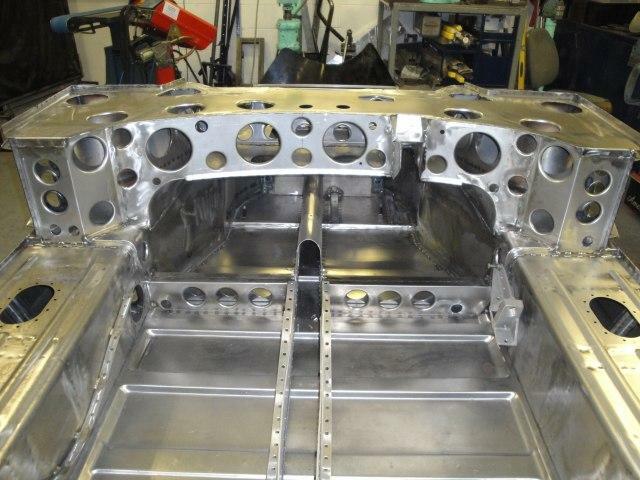 The lift away top to the tunnel ,gives access for water and oil line fitting which are different to a normal GT40. 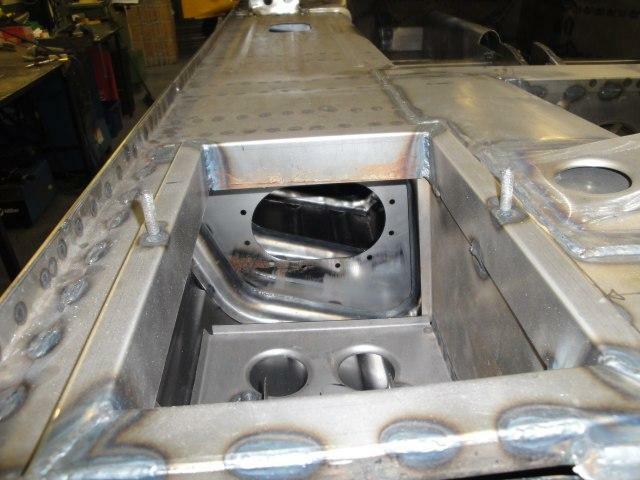 The water pipes have to travel over the top of the fuel cross over pipe. 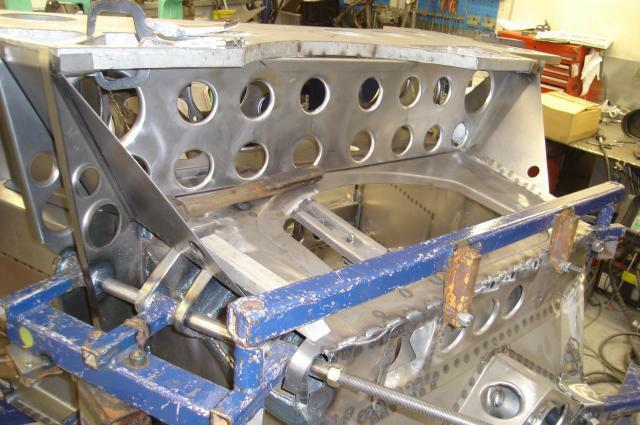 Extra holes that are only found on the Mirage are added to the flat front of the Chassis. 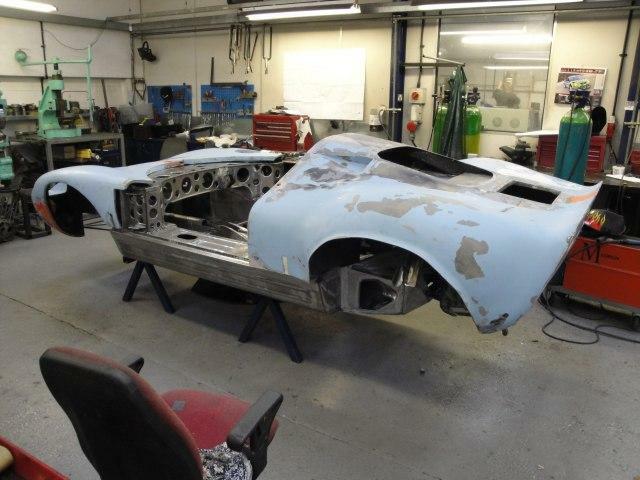 One of the main features of the Mirage Chassis is the flat front section, on a normal GT40 Chassis this is dished to accept the spare wheel. 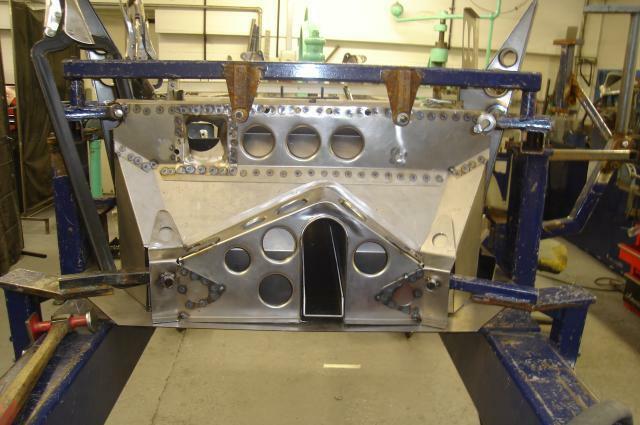 Complete nose frame ready to place in the jig. 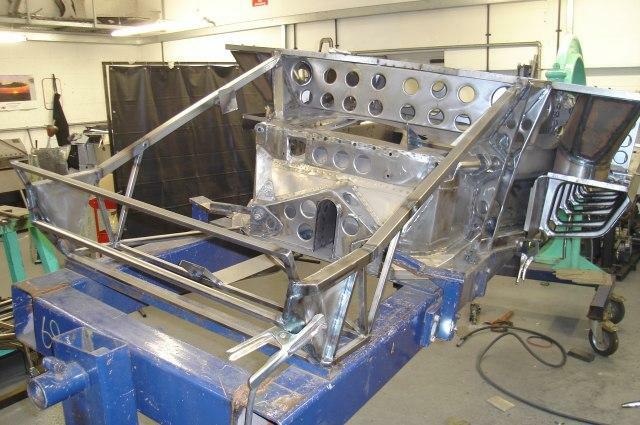 The nose frame is fitted to the square front end chassis. 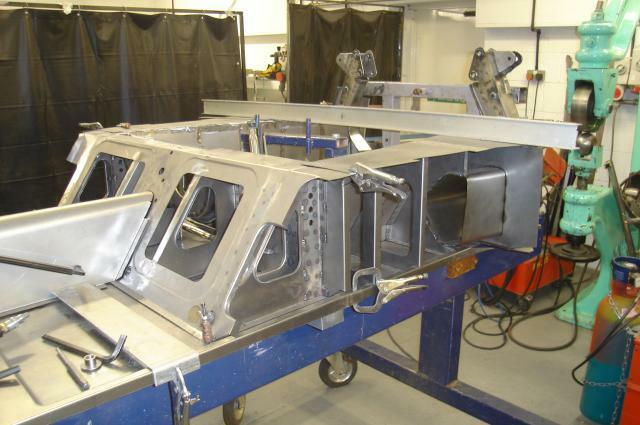 The main hull of the chassis is nearly finished, with the outer sill panels in place. 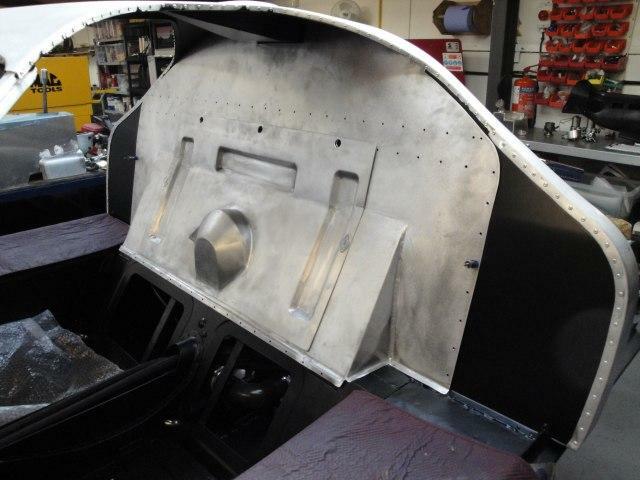 Front fuel tank cover being fitted, which also covers the fuel filler tube. 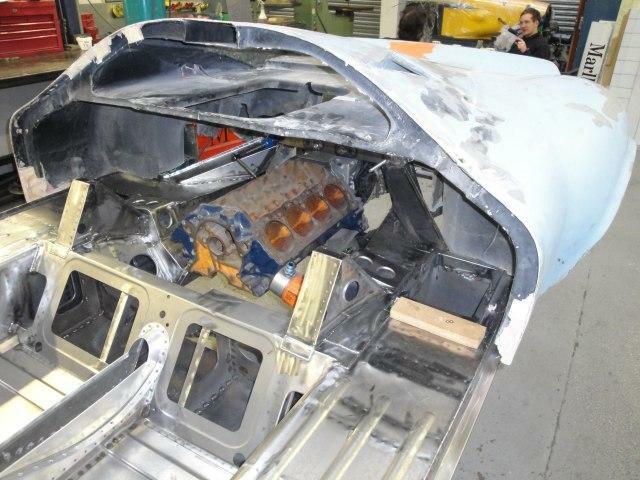 The Mirage ran the battery in the rear of the LHS pontoon, the battery bracket can be seen down inside the sill. 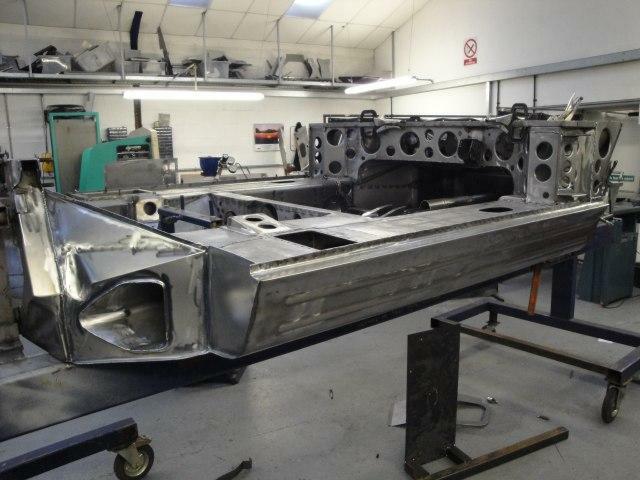 The sill ribs all in place, before the final outer wrap is spot welded on. 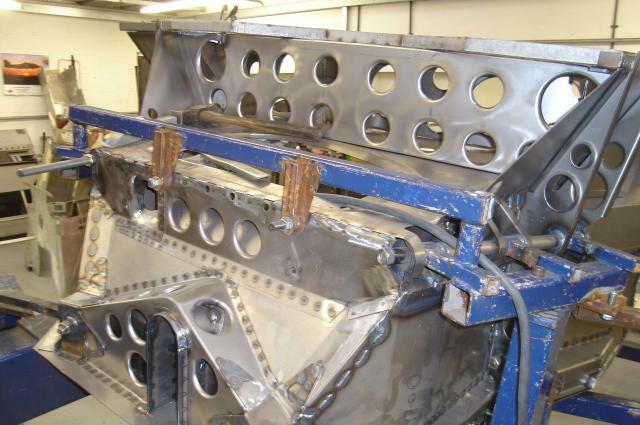 A period battery box lid is used to check battery clearence and bolt centers. 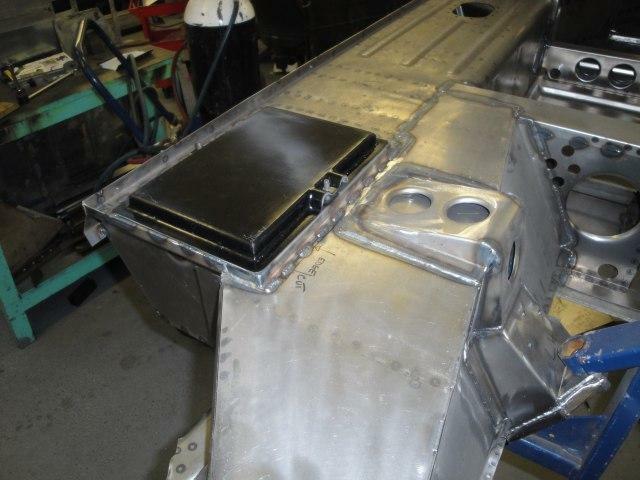 The short left hand fuel tank has a bulkhead panel down inside the sill which the fuel cell seals to. 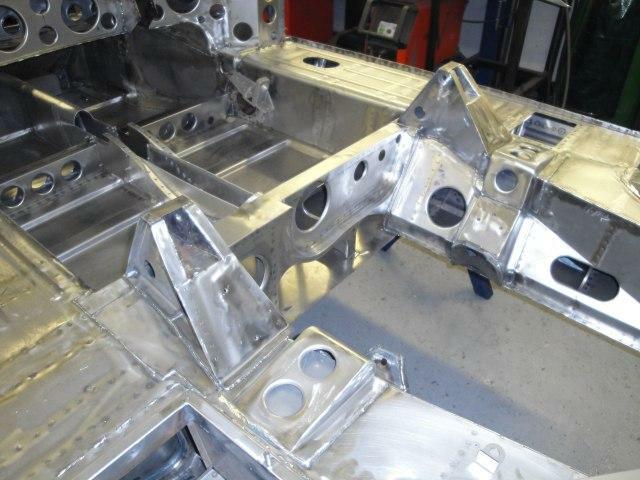 Gearbox cross member under construction. 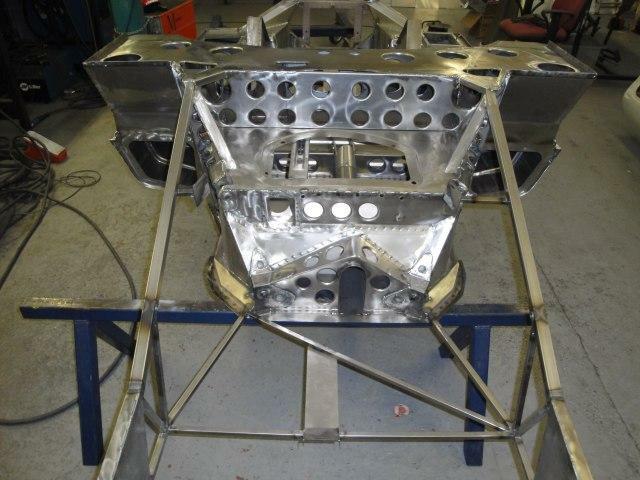 Finished inner rear end of the Chassis. 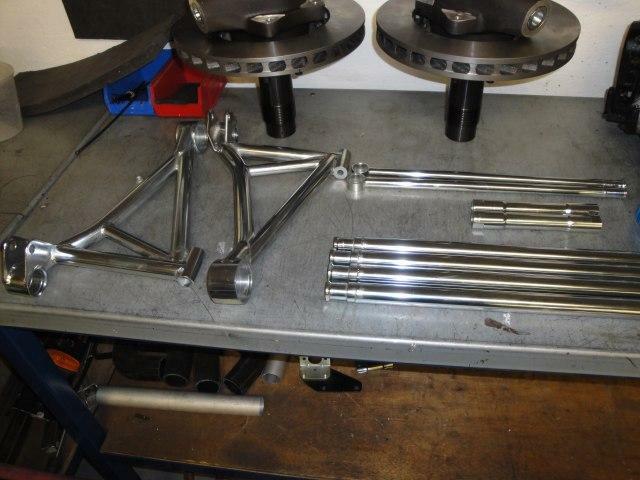 Finished LHS rear corner and radius rod tube. 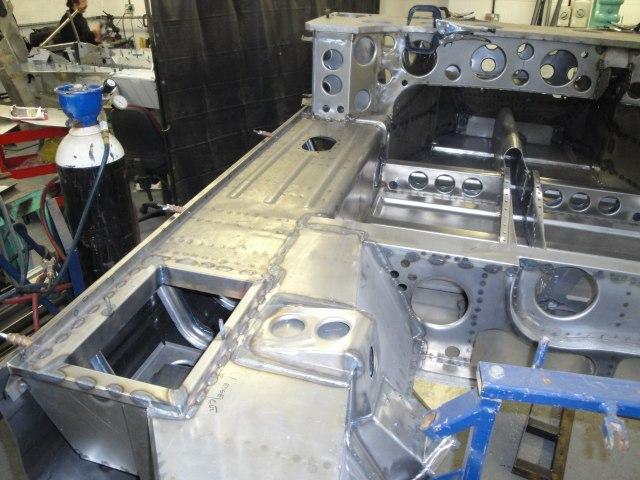 Radius rod mounts installed onto the Chassis. 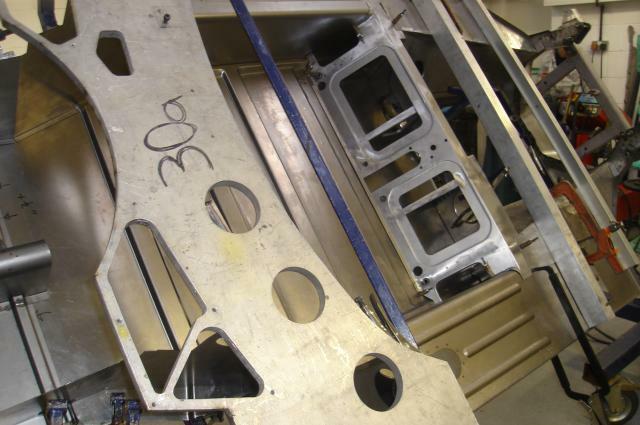 Detail of the Mirage dashboard bulkhead showing the extra holes that only these Chassis had. 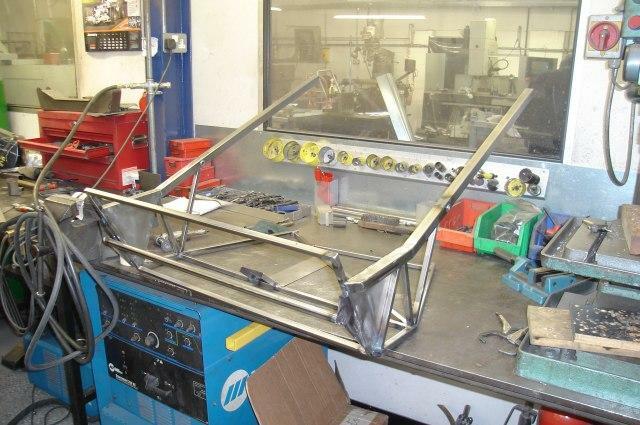 Free from the jig the roof can now be fabricated and fitted into place. 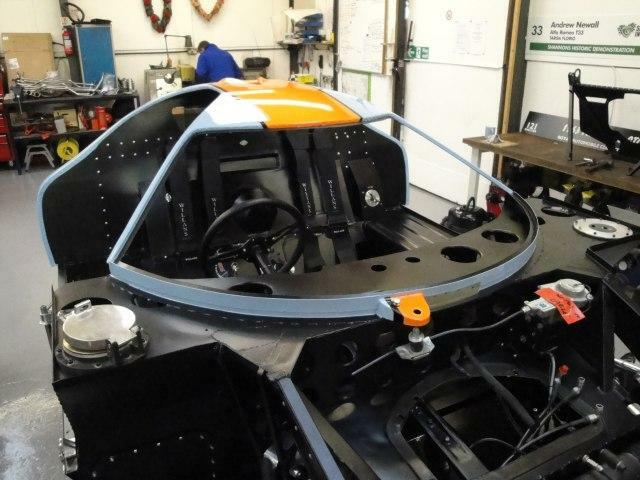 The completed front end, ready for trial fit of the original Mirage bodywork. 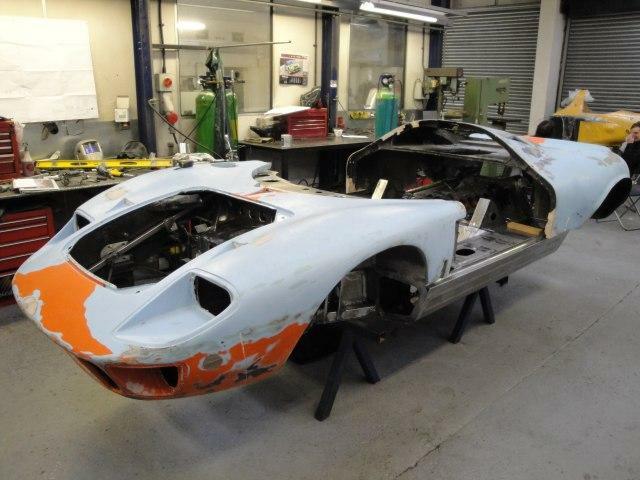 The original nose section from M10002 is placed onto the car to check nose frame position. 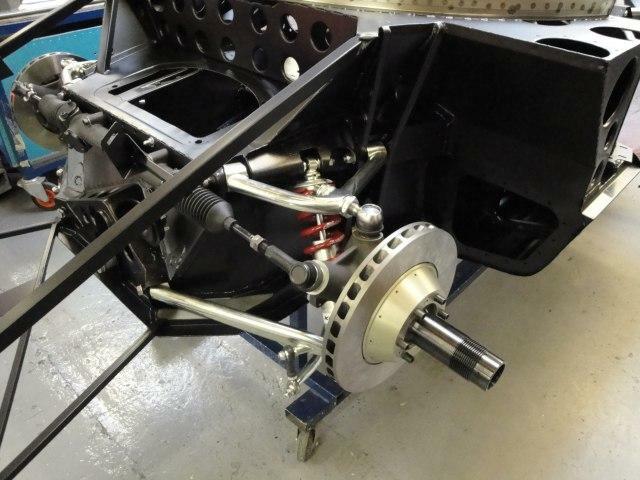 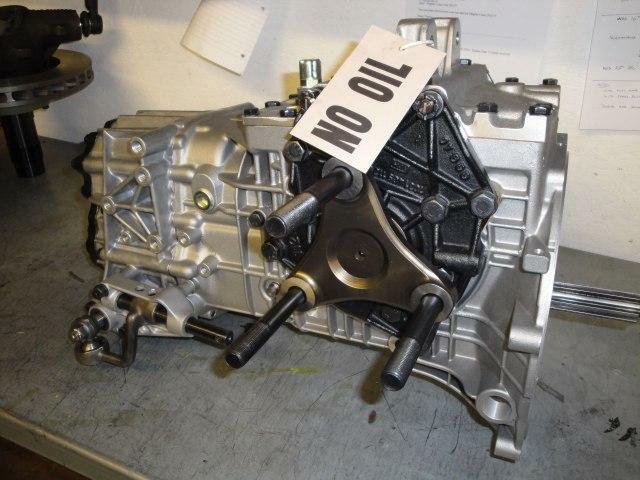 The gearbox, which will be used in the final build..
Mirage GT40 bottom front wishbones. 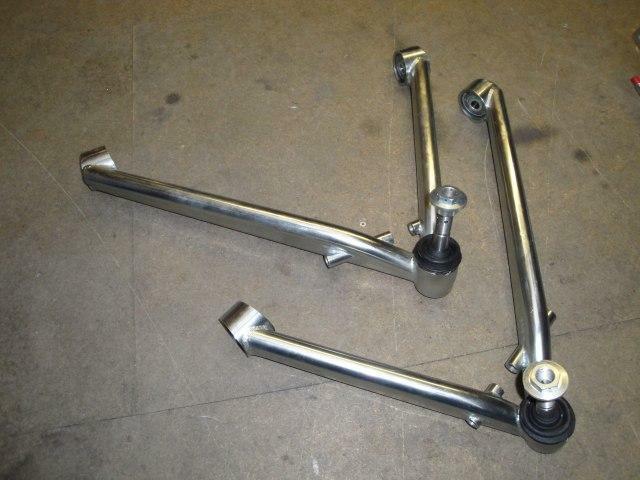 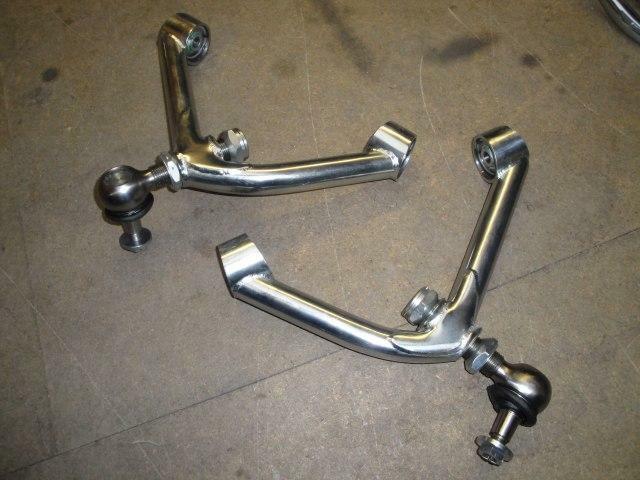 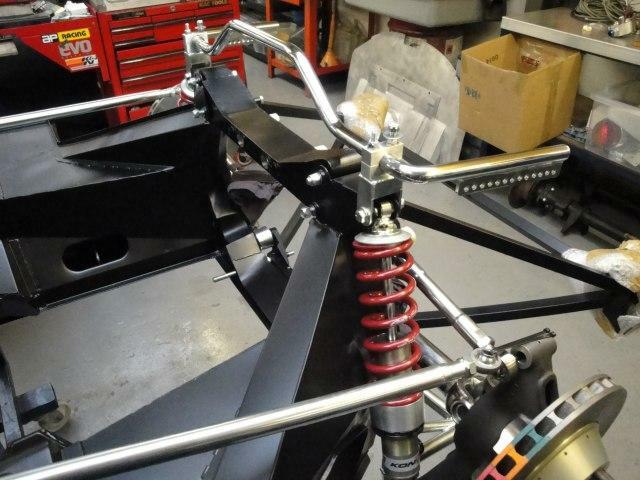 Complete and ready to install, top wishbones. 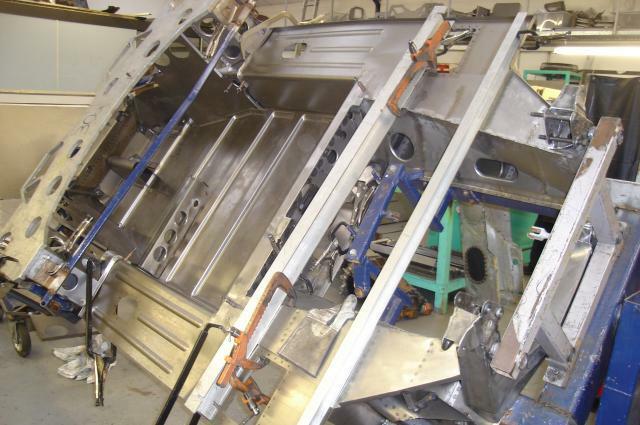 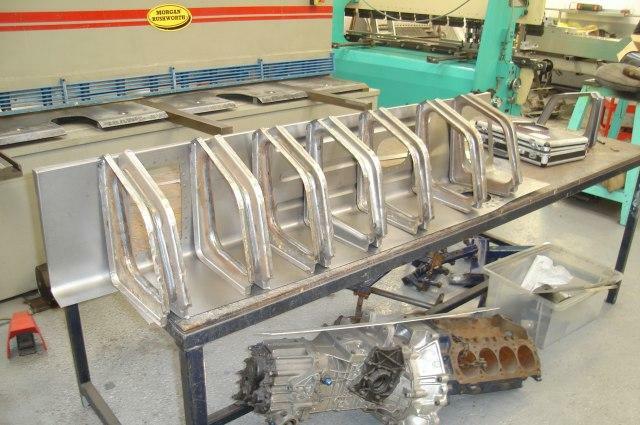 With the Chassis under construction, front corners are assembled ready to place onto the Chassis. 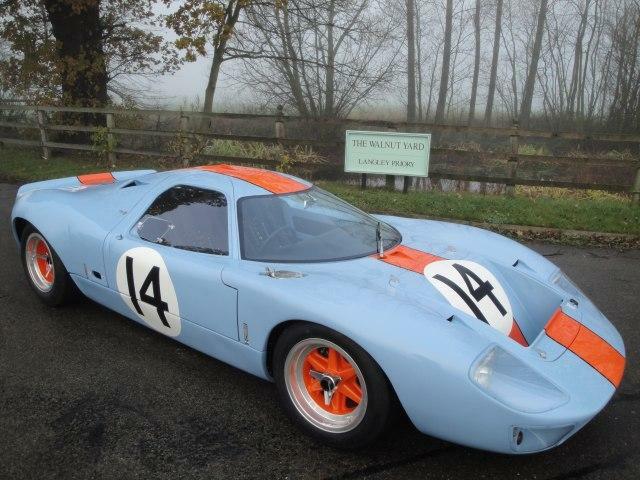 The Mirage ran the vented front and rear brake discs giving far more stopping power than the early solid type. 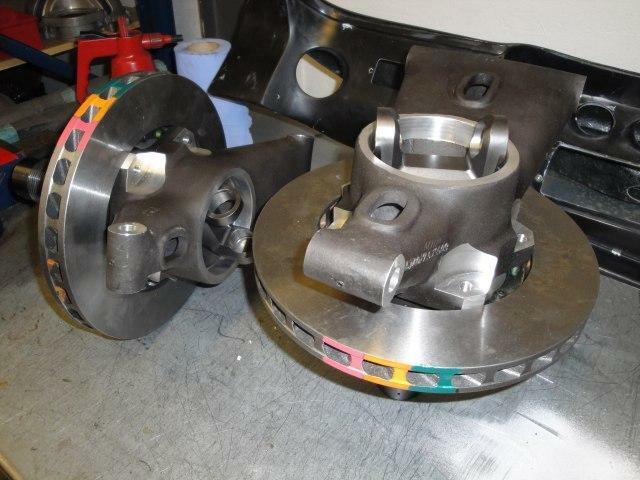 Rear uprights built up along side the fronts, the four piston calipers are being prepared ready to fit to the completed assembly. 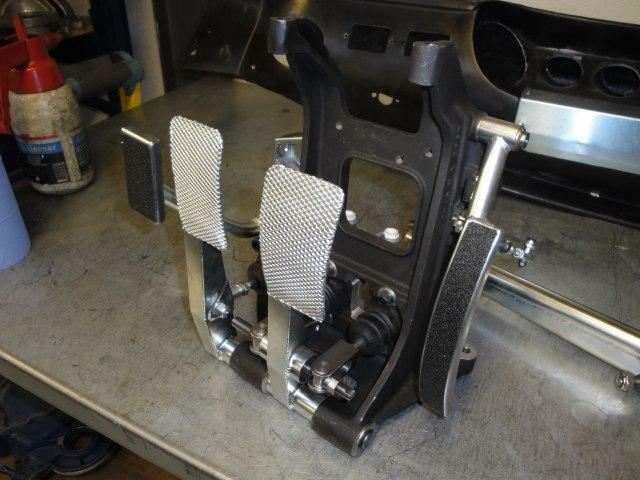 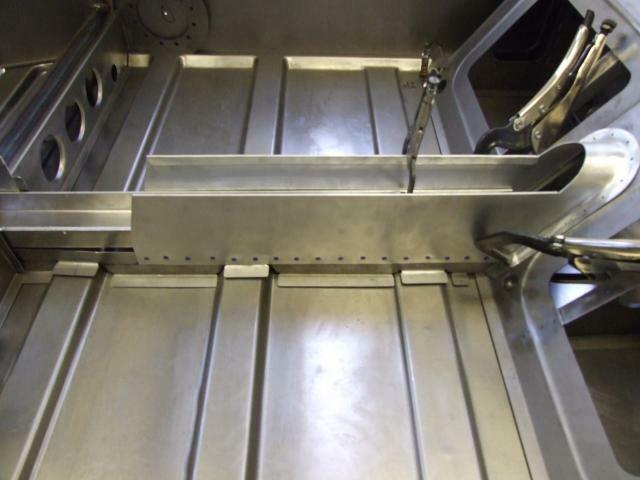 The finished GT40 pedal box, the casting has already been trial fitted into the Chassis. 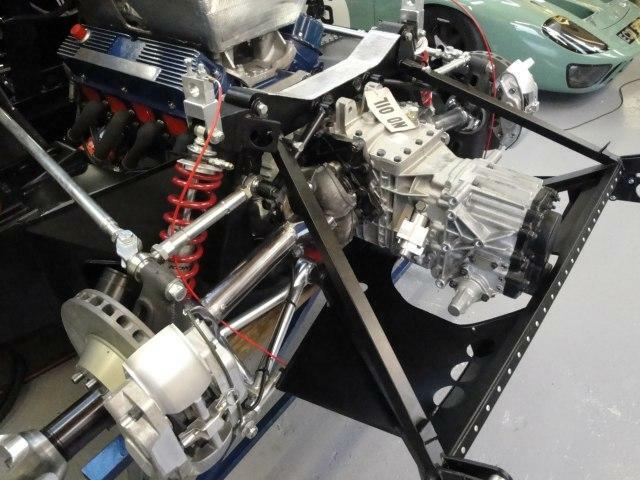 Period master cylinders are used to meet the FIA requirements for the HTP. 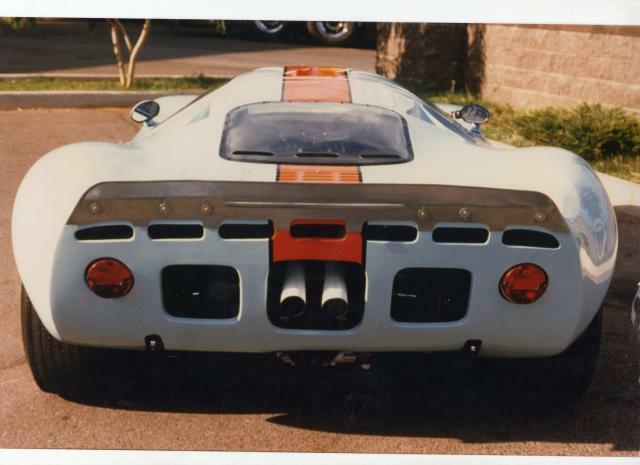 The original tail from M10002 is offered into place on the rear of the car. 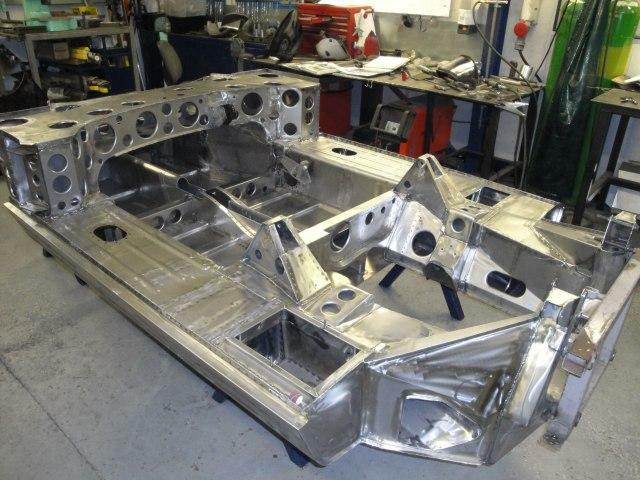 Starting to look like a Mirage, the next job is to fabricate the roof section. 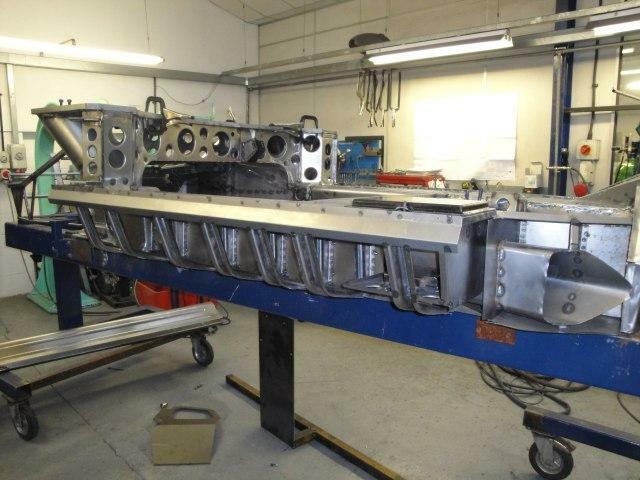 The roof starts to take shape… new jigs and press tools have been constructed to create this slimline light weight roof section. 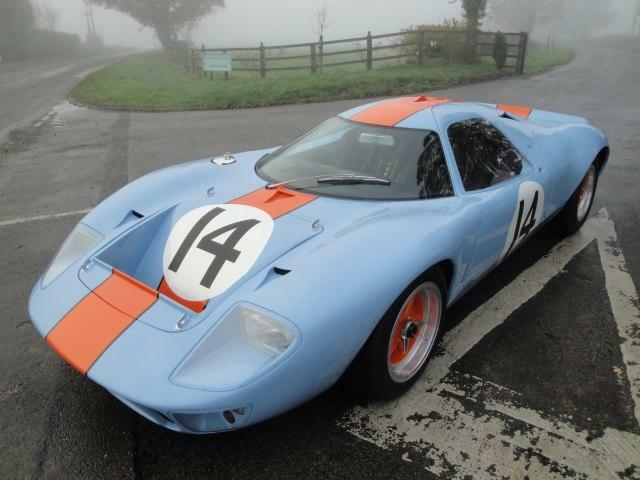 The Mirage roof has no inner roof panel, unlike a standard GT40, again done to reduce the total weight of the car. 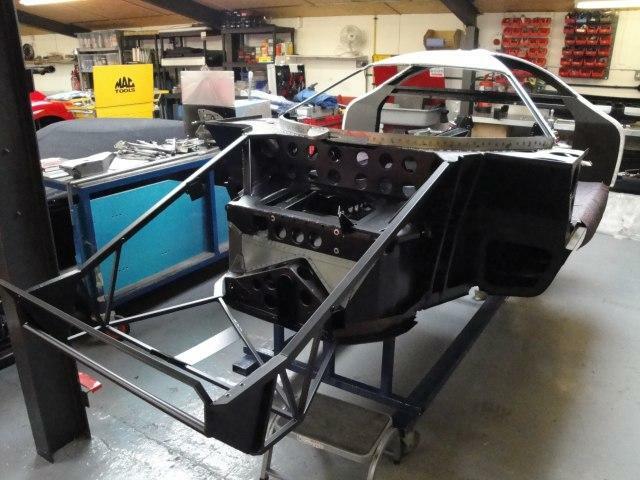 With the Chassis now powder coated in it’s original black finish, construction can now take place. 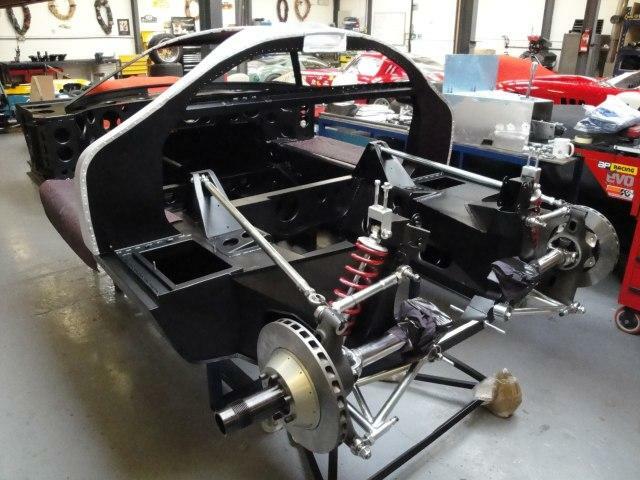 Rear suspension is fitted up to the Chassis.. all parts were pre fitted before painting. 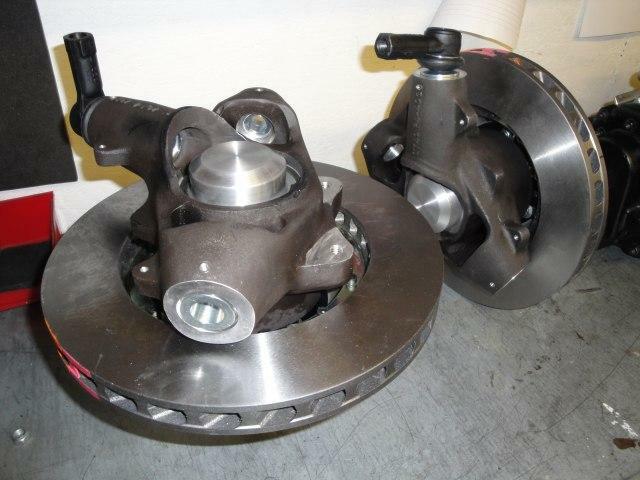 Vented brake discs as used on the Mirage and later GT40s. 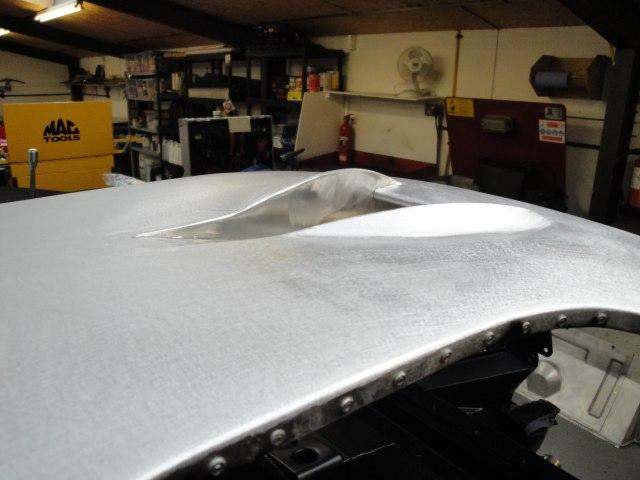 The special Mirage roof NACA duct which pulls air into the carb tray. 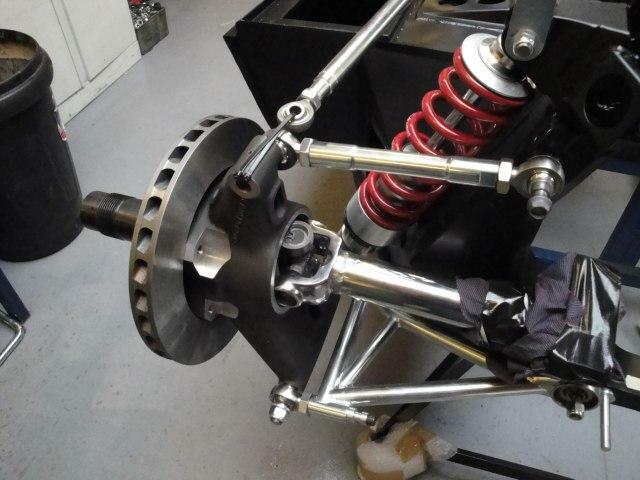 Front suspension is bolted in place along with the rack. 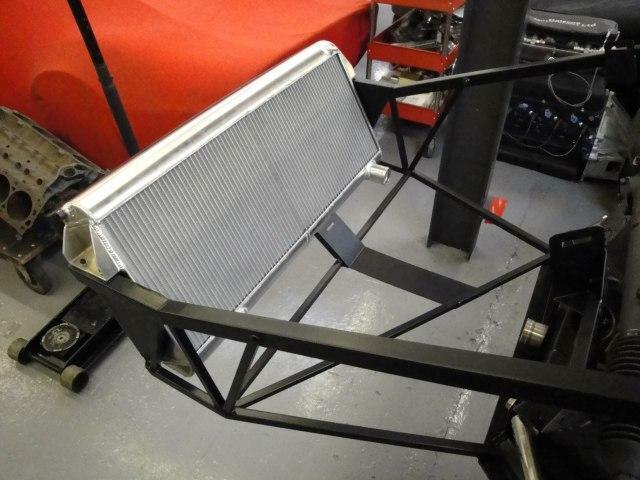 Radiator installed into the nose frame. 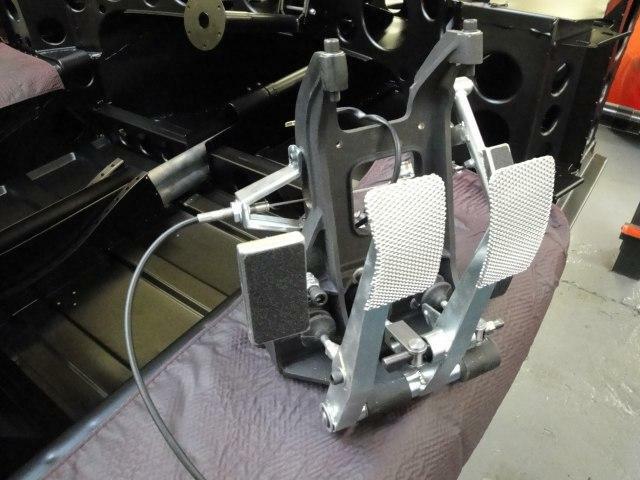 Completed pedal box prior to fitting. 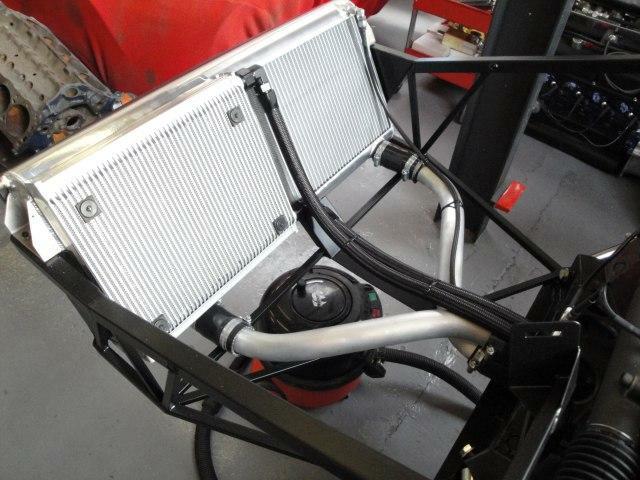 Oil cooler and water pipes fitted into place. 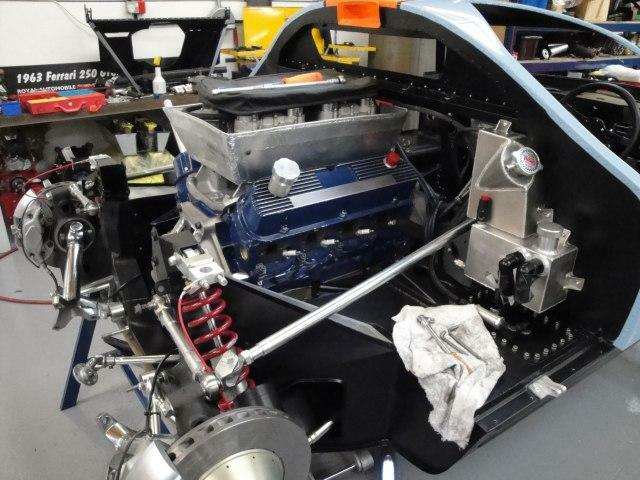 The engine will also use a rear mounted cooler to help control oil temp. 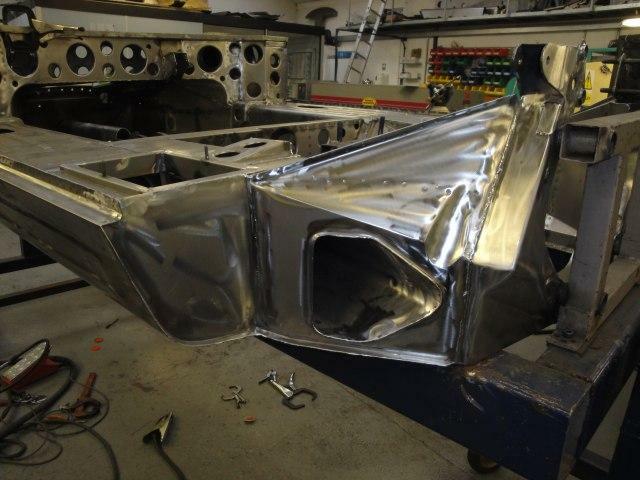 Mirage rear bulkhead is tryed in place prior to the fuel change over valve box being fabricated. 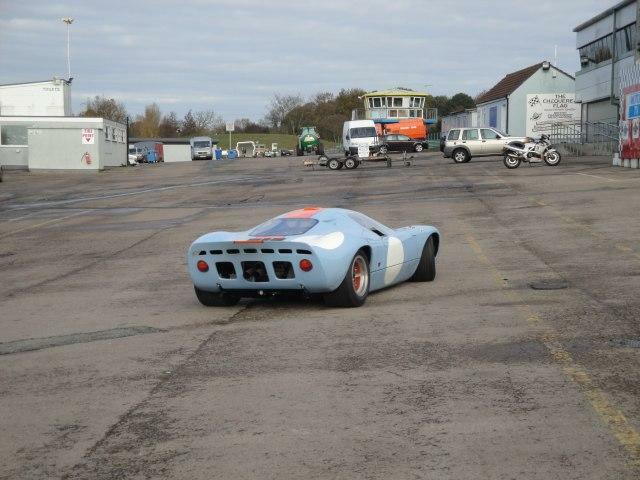 Brake fluid pots are located in a totaly different position to a standard GT40. 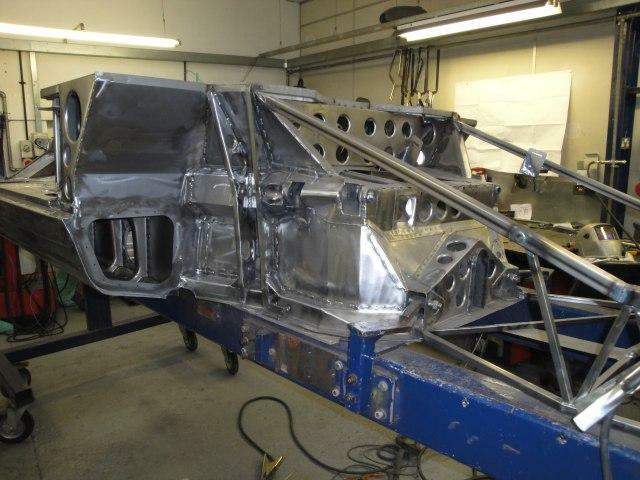 With the roof section now painted, the final build can take place. 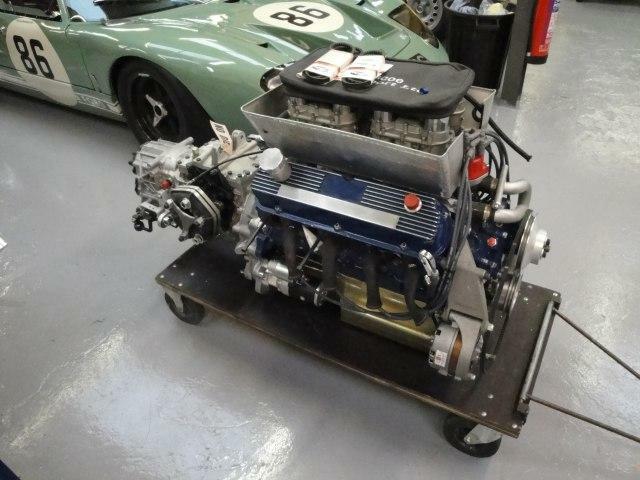 This car ran with the Ford 289 engine for the first few events of its life… its this spec engine that will be fitted. 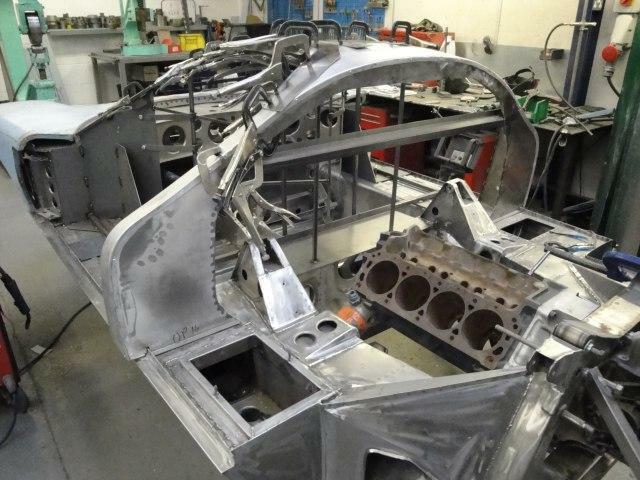 The engine bay is prepared for the installation of the engine and gearbox. 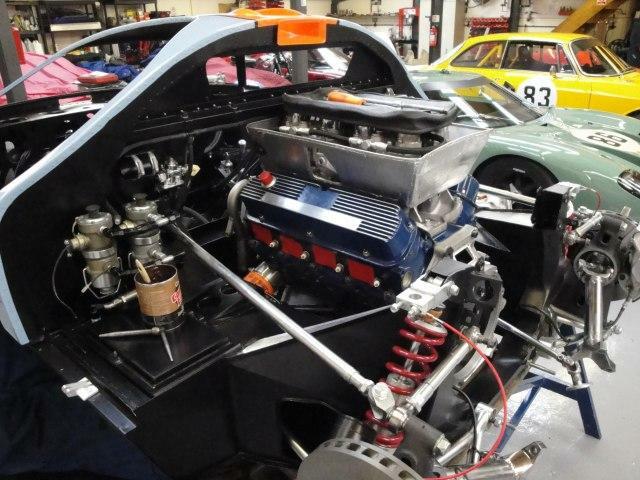 The Ford 289 installed into the Chassis, plumbing of the engine can now take place. 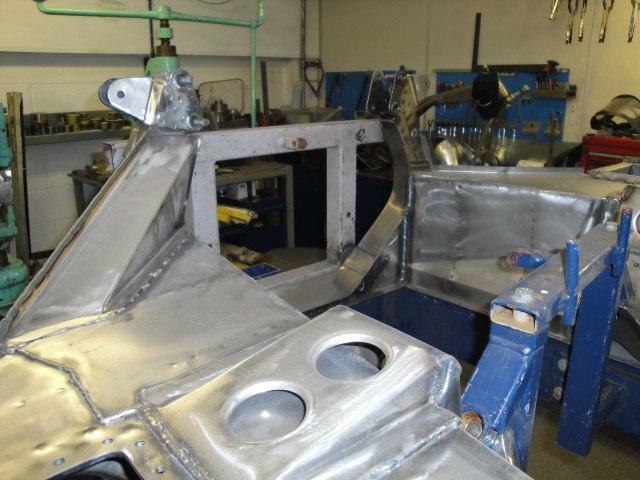 Water header tank and original oil catch tank are in place,ready to be connected to the engine. 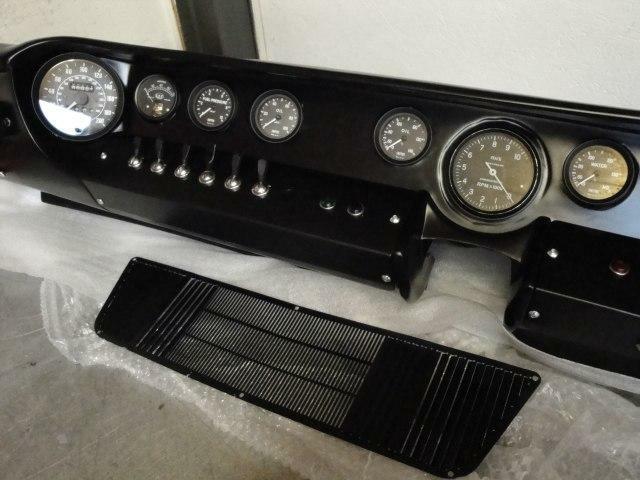 The now painted dashboard is built up with gauges and switches. 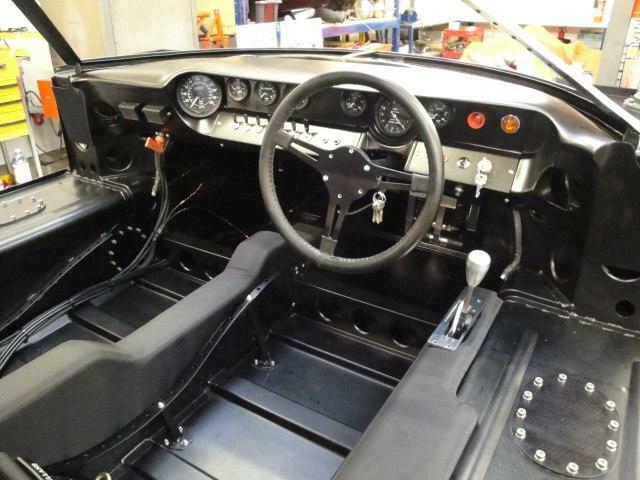 Original style gauges and switches are used in the constuction of the dash board, even the speedo is correct reading 200mph. 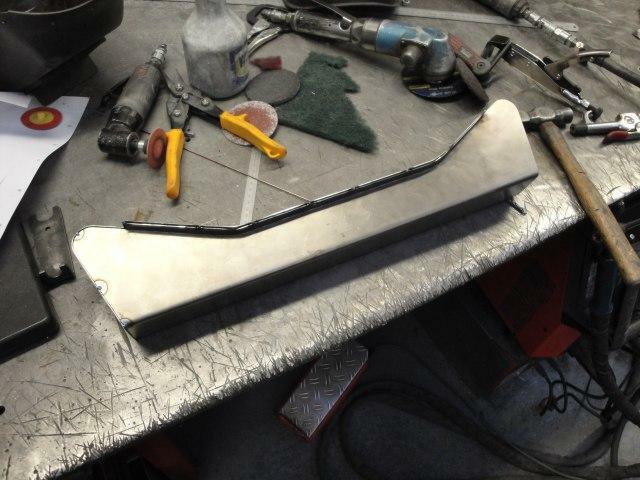 The heater vent is also ready to fit. 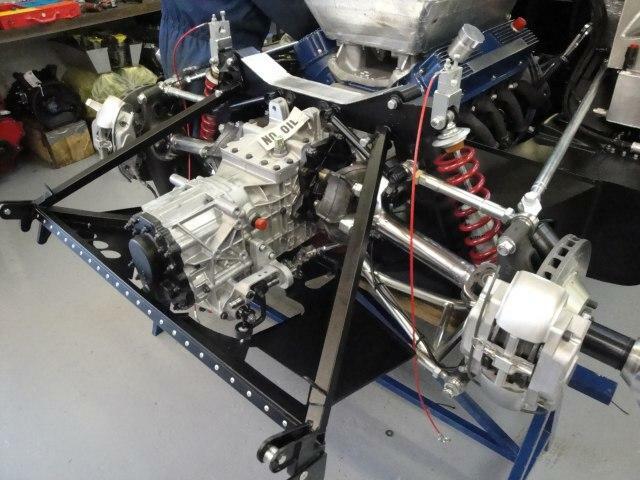 Gearbox is fitted to the engine and clutch operation checked. 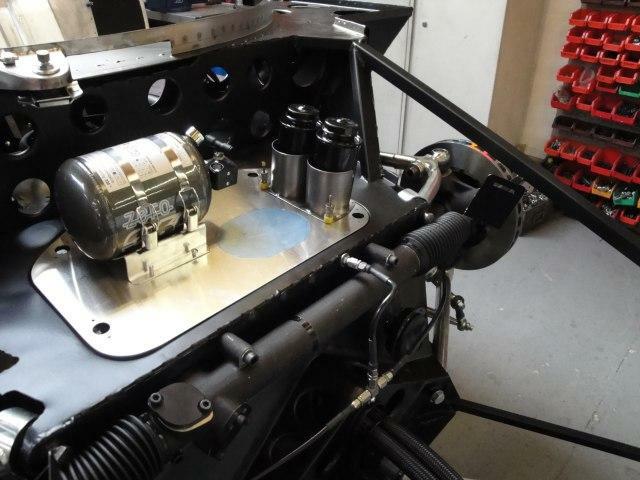 With the gearbox in place the rear frame is fitted and the gearbox oil cooler system is started. 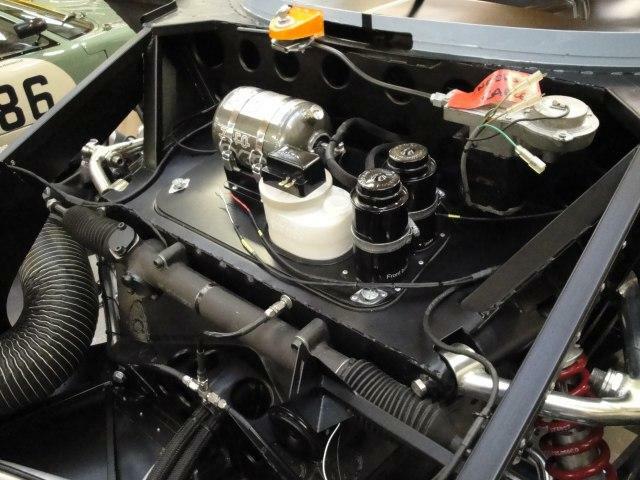 Original style fuel pumps… note the battery still in the rear of the sill, later cars ran fuel tanks right to the back and the battery moved inside the car. 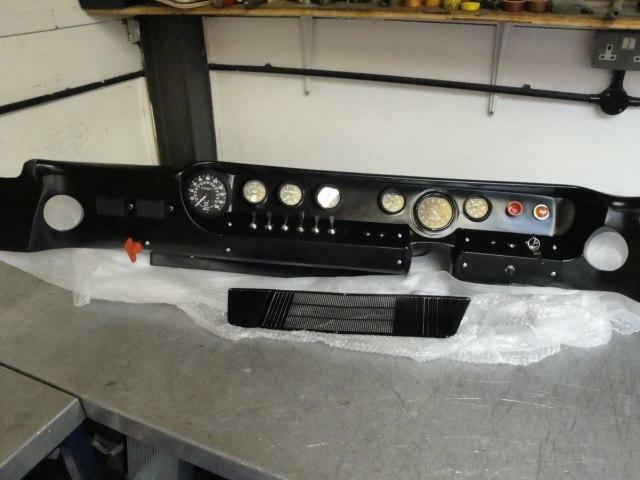 Dash board offered up, prior to wiring. 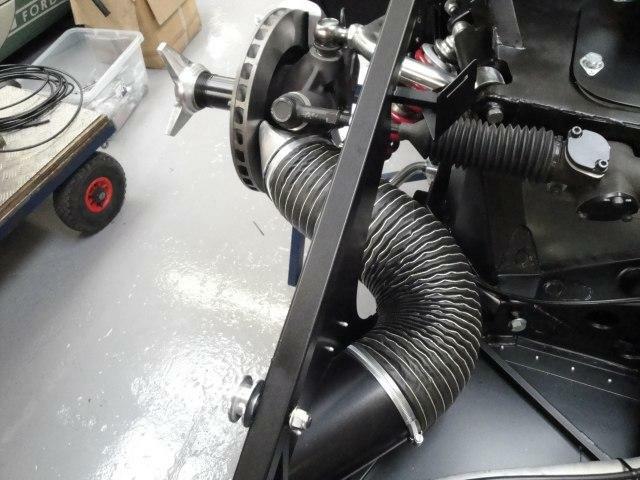 Trim panels cover the gear lever rod and the middle water pipes… note the flat floor which allows the use of the fuel cross over pipe. 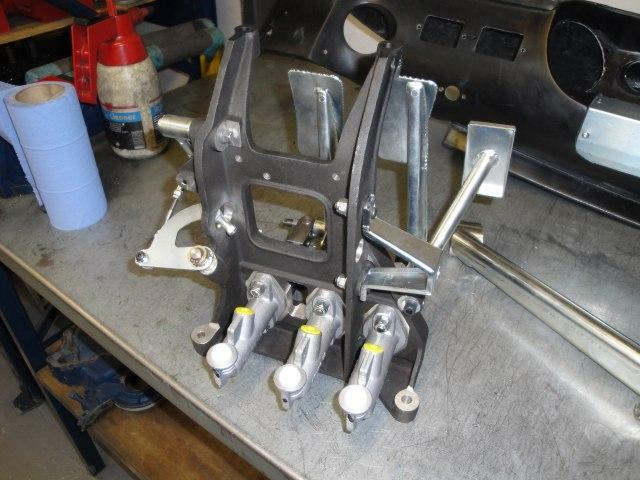 FIA fire bottle and brake fluid cylinders. 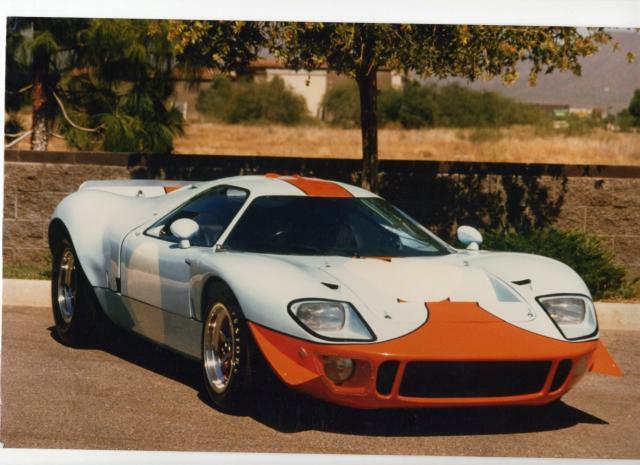 Due the the different spec Chassis, both are moved compared to a standard GT40. 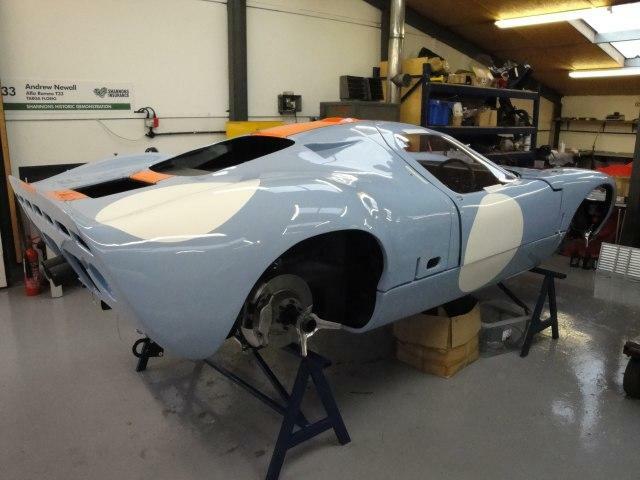 The finished car, M10002 sits outside GelscoeMotorsports workshop.